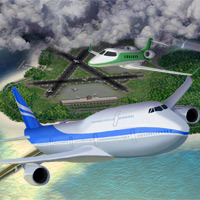 Airport Madness 4 Build 1.10 is now online. If you’ve already purchased this game, you can update it for free, directly from within the game. On the game’s main page, click on “An Update Is Available”. Check out this list of bug fixes and improvements. We will be doing another release next week, hopefully adding more features, most notably some improved voices, as well as a second launcher for each aircraft carrier. Unlike previous versions of Airport Madness, our goal is to make Airport Madness 4 stick, by adding fresh features and improvements on a regular basis. Check back regularly for updates! This entry was posted in Uncategorized on December 31, 2011 by admin. After 6 long months of development, we have completed Airport Madness 4 just in time for Christmas! There will be tutorial videos shortly, as well as a demo version as well as a facebook edition. As always, updates are free. Our first scheduled update is due December 31, 2011. Please report any issues that you may find so that we can incorporate the suggestions for changes. Our long term goal is to release a new version of Airport Madness each year, so stay tuned! This entry was posted in Uncategorized on December 24, 2011 by admin.